We were pleased to see that Westminster students were featured on the latest Vaughan W5- Thornhill Update Newsletter - Summer 2016 Edition. 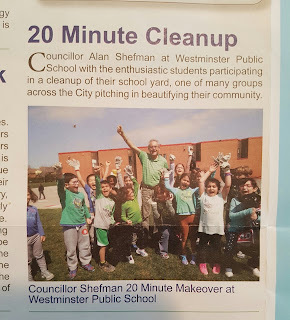 Councillor Alan Shefman's visit to our school during our Earth Day celebrations and 20 minute Clean-up was well received by our community. Thank you Mr. Shefman and way to go Westminster!